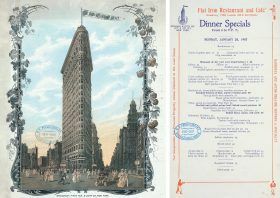 Did you know the Flatiron Building used to have a massive restaurant in the basement? New York’s iconic Flatiron building, built in 1902, gets plenty of attention for its distinctive, triangular design. But the massive restaurant that operated out of the landmark’s basement–known as The Flat Iron Restaurant and Cafe–has seemingly been lost to the ages. The basement restaurant allegedly could seat up to 1,500 guests. 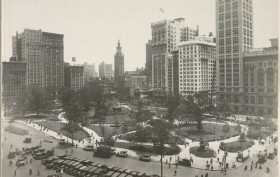 And by 1906, Madison Square had transformed from a desirable residential neighborhood for the city’s elite, as it had been in the Gilded Age, to a bustling commercial hub. The lengthy menu reflects that, with offerings that include affordable dishes of shellfish, meats, and sandwiches. 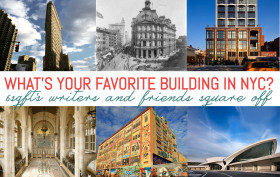 The Flatiron Building is one of the city’s most iconic and beloved landmarks. 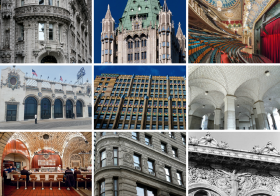 Since 1902 it’s been a symbol of New York, though ironically its acute angle formed by the intersection of Broadway and Fifth Avenue makes it an unusual sight in our otherwise orthogonal city on a grid. But while the Flatiron Building may be the most famous product of quirky street angles, it’s far from the only one. 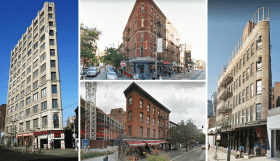 In fact, the “off-the-grid” streets of Greenwich Village and the East Village contain scores of them, most of which pre-date the 23rd Street landmark. 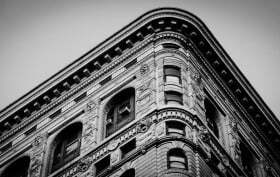 Picture this: You walk by the Flatiron Building, one of the most recognizable landmarks in the entire city, and see a man positioning himself to jump off. Today, you’d call 911 without hesitation, but 50 years ago it was annual spectacle. Ephemeral New York uncovered the story of Henri LaMothe, the “diving daredevil” who performed a stunt around the country where he did his “flying squirrel” dive from 40 feet above ground into a collapsible plastic pool with only four feet of water. 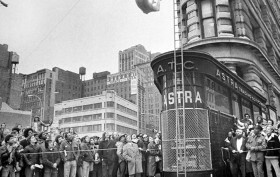 On his birthday on April 2, 1954, he climbed to the 40-foot mark on the Flatiron Building and did his signature jump. For the next 20 years, he performed the feat annually on his birthday, decreasing the water level each year. On his 70th birthday in 1974, he dove into a pool filled with merely one foot of water, and many say when he stood up, his back was still dry thanks to his famous belly flop.